If the Comptroller’s office ever does their job, comprehensive TIF reports will be available. So far they don’t have the software completed to allow entry of information. Information from 3/13/17 for Normal and 4/30/17 for Bloomington isn’t complete. The Uptown TIF Fund reported a decrease of $2,967 for the year, resulting in a zero-balance fund balance as of March 31, 2017. This was part of a final development agreement payout. 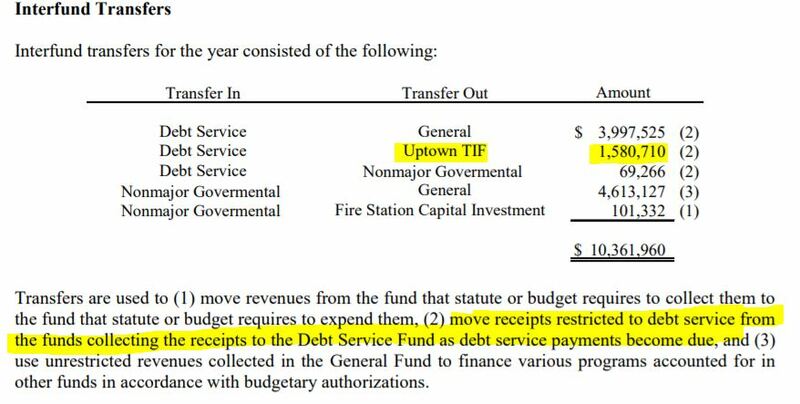 The Uptown TIF Fund, also a major fund, is used to account for revenues generated within the established TIF district and expenditures used to make principal and interest payments. The Town of Normal has entered into various tax rebate agreements with local developers and corporations under municipal code. Under these agreements, the Town rebates a portion of sales and TIF taxes. For the fiscal year ended March 31, 2017, the Town rebated a total of $1,554,717 in taxes under these agreements. PDF page 145 has a recap of the Uptown TIF for the year. It shows revenues of $1,933,325. The ending balance is ZERO. As of 3/31/16 the Town left $2,967 in the fund. Since as of 3/31/17 the balance is zero, they needed the money. At year-end, the Town of Normal had total outstanding debt of $92,320,992 as compared to $94,163,699 the previous year, a decrease of 2.0 percent. To date, the General Assembly has set no limits for home rule municipalities. Another reason to abolish Home Rule! Of course property taxes increased every year – the Town raises the rates every year. Utility Taxes have been decreasing since 2013 – I remember Bloomington’s Finance Director saying that shows a population decline. Of course Local Sales Tax is up – they raised the rate. Liquor taxes have been decreasing since 2013. Motor Fuel taxes have been decreasing since 2015. Food and Beverage taxes also show modest increases. That’s an increase of $4,242,606. Property taxes were raised anyway. Government never has enough money. Posted in BloNo, Koos, Local, Normal, Progressives, Taxes.Tagged Annual financial statements, Debt, Home rule, portillos payoff, Tax receipts, TIF, TOWN OF NORMAL, Uptown TIF.